Three teams of four students from the Business School will compete in the semi-finals of the IBM Universities Business Challenge after successfully progressing from round one. 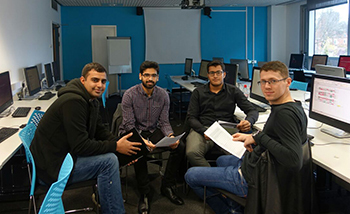 Comprising 12 accounting and finance and international business management undergraduates, the Middlesex competitors are being mentored by Graduate Academic Assistant John Magpayo, himself a graduate of the University's BA Accounting and Finance programme. All three squads are now hoping to reach the Grand Final, which is being held at IBM Southbank in London, where the finalists will compete for a £1,000 first prize. 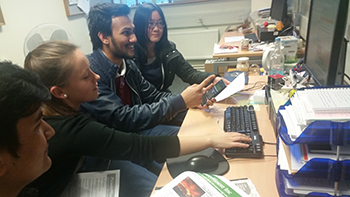 The Universities Business Challenge is the UK's longest established simulation-based competitive challenge for undergraduates and is designed to develop employability and enterprise skills, and Certificates of Participation are awarded to students as they progress through each round of the challenge to reflect their achievements. "Taking part gives you an understanding of how companies deals with real-life situations in a business," says Tayyeb Baig, a second-year BA Accounting and Finance student. "With the provided scenario of a company, you have to go through every detail such as breaking industry news, the company profile and a financial report in order to finalise your decisions." In each round of the competition, the teams must work together as a board of directors in realistic, simulated company, and must make critical business decisions that affect performance. "Team members play a very vital role when you take part in this competition. It's all about teamwork," adds Tayyeb. "Taking part in this competition can also develop leadership skills and give you a better understanding of financial criteria, which will be helpful in future and add value to our CVs." Fellow second year Radoslaw Wezowicz has also found the competition to be very complementary to his Accounting and Finance degree. "Participating helps the practical understanding of the issues that we find every day at university and teaches us what is extremely important," he explains. "Rivalry and the opportunity to demonstrate our skills are the driving factors for our team, whose goal is to win this competition. 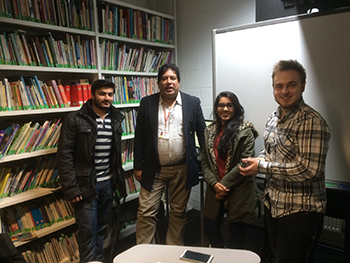 I hope that we can achieve this and show that Middlesex University is the best." Also taking part against 37 other university teams in the Bristol semi-final on 10 March are BA Accounting and Finance students Dave Toussaint, Jacqueline Xiao, Syed Raza and Hameem Mussa; BA International Business undergraduates Hamza Kokni, KC Bipin, Murtaza Bharmal and Manan Suru; BA International Business and Mandarin final year Grzegorz Krause; and BA Business Accounting second year Silje Hansen.